Nick Mason says he thinks that a box set celebrating Pink Floyd’s 1977 album Animals is likely to happen at some point in the future. He continues: “It’s just sort of slow because of differences of opinion about how to do it or what to put on it, but I’m sure it will eventually happen. 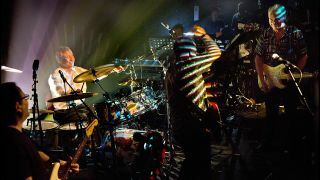 Mason and his band Saucerful Of Secrets have further live shows lined up across the UK and North America next year, which will see them revisit early Floyd material, including tracks from The Piper At The Gates Of Dawn and A Saucerful Of Secrets. Asked in the same interview if there were plans to play any other pre-Dark Side Of The Moon tracks at the shows, specifically Echoes, Mason replies: “Well, the problem with Echoes is there was a feeling like it has so much to do with Rick Wright that we wanted to steer clear of it. Mason also reveals that Roger Waters could join Saucerful Of Secrets onstage for a couple of tracks in 2019, but cautions: “He said that he might come and guest for a song or two, but I’m not holding my breath on that.